"Shop for 2 In 1 pencil set from Vivid Promotions Australia to promote your brand name and logo. 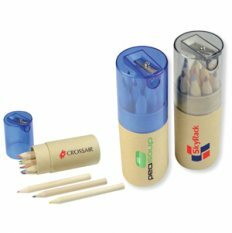 It is perfect promotional product for traveling purpose. The 2 in 1 Pencil Set makes a great gift for kids and adults. It is a cylinder shaped paper tube packaging. Some important features are: Colours: Translucent Blue and Black Product Size: 35mm w x 115mm Decoration: Pad Print: 20mm w x 35mm h Packaging: Carton Size: 385(h) x 385(w) x 245(l) mm, Carton Weight: 12 Kgs / 200 Pcs Get customized your brand name with this promotional 2 in 1 Pencil Set. For more promotional product visit our website at www.vividpromotions.com.au"